Successes and failures, both personal and professional, often boil down to opportunity management. A great opportunity can quickly go sour if it isn't properly managed, and a bad situation can be turned into a great opportunity if handled the right way. Often, great managers are identified by how they manage challenges and opportunities, and these individuals tend to be perfectly-suited for getting a company intranet off the ground. A social intranet software platform represents a great deal of opportunity for any organization, but if it's not properly managed, it's impossible for the benefits to truly shine. To help your organization get the most out of your intranet, here are 20 things the intranet manager should be doing, all of which combines to form a comprehensive approach to managing your company intranet. 1. Split Available Time in an Effective Manner. Intranet managers are always limited on time, which is why learning how to split time effectively is so important. In general, the intranet manager will get the most benefit out of spending approximately 1/3 of their time on daily maintenance, 1/3 on new projects, and the final 1/3 on managing staff relationships. 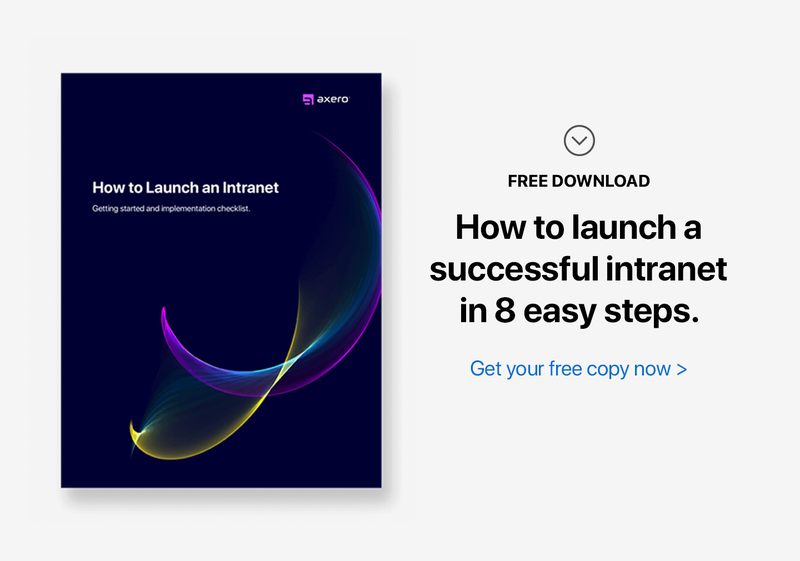 While there is no one-size-fits-all template to streamline intranet management, these principles are highly effective when properly implemented. 2. Ensure that Notifications are Going Out. Notifications are essential to keep staff members up to date on what's going on within the social community. Email notifications are very helpful in this regard, but there are other ways to notify employees throughout the week about new messages, changes in the status of a project, and more. It's essential for the intranet manager to ensure that employees are getting the notifications they need to keep productivity from getting interrupted. 3. Start Things Off with a Solid Plan. Your intranet should always be viewed as somewhat of an experiment, but that doesn't mean you should jump into one without a solid plan. Having goals for what employees should accomplish on your intranet will help you and your team track measurable successes. No intranet should launch without establishing solid goals, and writing things down during your intranet planning process is the best way to ensure that everyone is on the same page. 4. Determine the Needs of Community Members. No intranet can thrive if it's not designed to work for those using it. The intranet manager should take the time to determine the needs of community members from the very beginning, either by implementing a virtual comment box or reaching out to employees individually and asking what features they'd like to see. The earlier you can identify the needs of employees, the fewer the hurdles, and the better you'll be at doing your job. 5. Reward Employees via Gamification. "Gamification" is a buzz-word in the business world these days, and for good reason. The concept is to turn the social intranet into a game for employees, and they'll be rewarded when they post content, create ideas, and otherwise make good use of the intranet. Intranet gamification can be used as little or as much as you choose, and when executed properly, it can return extremely positive results. 6. Manage Time While Keeping Company Objectives in Mind. Most companies have a timeline of objectives to avoid any potential pitfalls. Intranet managers need to keep these objectives in mind at all times and use them to guide how they approach intranet governance. Make a list of your company's current needs and objectives, and try to cross them out, one-by-one, over a period of time. 7. Maintain a Strong Brand Identity on the Intranet. Brand identity is often considered most effective when appealing to an outside audience, but it has tremendous value when used within an organization as well. Strong branding can help foster feelings of solidarity among employees, thus helping to improve employee engagement and boost levels of both creativity and productivity. Maintaining a strong brand identity on your intranet is as much about design as it is attitude, and should be a priority for intranet managers. 8. Ensure that High-level Support and Involvement Exists. Executives play a huge role in how things pan out in any company, and this is especially true when it comes to your intranet. Employees need to know that upper-management is there for them should they have any questions. This means the intranet manager needs to be fully-involved in the trajectory of the company intranet. It may be necessary to cater specifically to executives first, to ensure they aren't lacking in intranet involvement, but you can expect things settle down as time progresses. 9. Publish and Maintain Content. Content marketing is extremely effective to external audiences but it's just as effective, if not more so, to internal audiences as well. Posting documentation and user guidelines, for example, can help to ensure that any type of confusion is minimized. Therefore, one of an intranet manager's main responsibilities is to publish and maintain content, which can be a time-consuming job. Bearing this in mind, proper planning and creating an effective schedule for content creation can help keep problems at bay. 10. Don't Neglect the Importance of an Internal Newsletter. There is tremendous value in creating an internal newsletter that keeps staff members apprised on community events. Sharing intranet news doesn't have to be extremely detailed, but it should keep people informed about major happenings and ensure that no one falls behind. While daily newsletters are effective, some organizations find that weekly offerings are more reasonable. Intranet managers need to focus on a variety of tasks and issues, and providing support is high on the list of priorities. Providing support can get you a long way, especially if you're able to articulate things so that all employees can understand. Try not to let support tickets pile up, as it's best to approach each problem immediately. 12. Keep Your Intranet Organized. Anyone who has worked in a kitchen knows that half the job is sanitation ... and the same is said for those managing a social intranet. As your intranet grows, it can become so full of content that maintaining cleanliness can become challenging. Part of being an intranet manager is ensuring that clutter doesn't get in the way of the user experience. This means you need to stay on top of your intranet organization practices and techniques. You'll be surprised how far this can go when you truly put the time in, as a clean intranet is a productive intranet. One of the things that managers love about intranet software is that it allows for complete control. This includes setting permissions for users, which will govern what they're allowed to do and how much influence they have on the intranet as a whole. Those with managerial roles, for example, should be given a separate set of permissions from staff members whose primary role is to create content or participate in discussions. Setting permissions is easy and can make for a more secure, streamlined intranet. 14. Make Sure Old Content Gets Archived. Your social intranet is the perfect place for content to live for years to come. This is true not only of new content, but content that may have existed prior to the implementation of the intranet as well. As part of your intranet content strategy, managers should ensure that old paper documents get scanned, uploaded, and filed-away in a way that will make them easy to recall. It may seem like a tedious task to handle alone, so enlisting a group of people to help is the best way to go. When you consider the time saved when your staff no longer has to leave the intranet to refer to paper documents, it becomes clear just how worthwhile archiving old content can be. 15. Look Towards the Future. Your intranet is an ever-growing, living organism, and it's essential to remember there's always room for positive change. Take a look at modern social networks ... the majority have seen highly-noticeable changes since they were first introduced to the public years ago. Look towards the future and focus on things to improve the user experience. This will help prevent stagnation from occurring. 16. Pay Attention to Intranet Trends. Trends come and go, but this doesn't mean you shouldn't pay attention to them. Keeping track of your own intranet trends can help you make changes that better suit the needs of your employees. You may find that particular spaces are being used on a regular basis while others haven't been visited in weeks ... the latter might be good candidates for deletion. Trends help you determine the difference between aspects of your intranet that work and those which do not. There are countless hurdles that an intranet manager encounters on a regular basis, but perhaps the most problematic is that of intranet adoption. Just because you know your social intranet is the heartbeat of your organization doesn't mean that your employees are going to feel the same way. This is why you have to encourage adoption whenever possible. This is especially true when first launching your intranet, in which case low adoption levels can cause many problems. You may have to work with staff members one-on-one at first to improve adoption levels, but the time spent will pay off immensely. Every business professional wants to be successful at what they're doing, yet determining success is often difficult. This typically results from taking a subjective, arbitrary approach rather than using substantial numbers and data. When you set baselines and pay attention to how things shift over time, measuring success becomes far easier. Take diligent note of changes in company culture, email usage, employee engagement, and anything else you're looking to improve with your social intranet. This helps ensure a baseline measurement as time progresses. If your intranet is riddled with bugs and technical issues, even the savviest users will have a hard time getting things done. When bugs are left to get worse, they can become even more difficult to fix, eventually rendering the intranet unusable. Intranet managers should fix technical issues the moment they're discovered, as doing so can eliminate many future headaches and prevent things from getting out of control. One of the largest benefits if intranet software is the marked increase in collaboration between employees. When staff members collaborate with each other, the amount of money, time, and energy that's saved is remarkable. Intranets do make collaboration easier, but there are always things you can do to further facilitate it. Pairing employees together on a specific project, for example, is a great way to spark new ideas for your organization. Being an intranet manager is no easy task, but it's one of the most important intranet team roles that anyone can hold within a company. Strive to do your best, and you'll be met with appreciation by everyone in the organization.